Kindle DX: When Does the Fire Sale Start? Amazon seems to be making all the right moves lately. Its Kindle e-reader, both the Wi-Fi and 3G versions, is a perennial best-seller in the online retailer's store, although Amazon remains shy about releasing exact sales figures. And reports of its upcoming (if unannounced) tablet device are very positive, indicating that Amazon may be the first serious challenger to the Apple iPad in the tablet biz. Assuming the Amazon tablet is real and ready to ship, what's to become of the Kindle DX? An oversized e-reader with a 9.7-inch E-Ink display, Amazon's Kindle DX stands out--and not in a good way--in a rapidly changing tablet/e-reader market. Overpriced at $379, the DX lacks the capabilities of less expensive Android tablets now hitting the market, including the $330 Acer Iconia Tab A100, the $300 Viewsonic ViewPad 7, and the $250 Lenovo IdeaPad A1. And even though the four tablets listed above have smaller, 7-inch color screens, they're more iPad than e-reader--the distinction being that the latter is used primarily for reading books. But wait, there's more. Barnes & Noble's successful $250 Nook Color and Amazon's upcoming 7-inch color tablet--also expected to cost $250--only make the oddball Kindle DX look worse. The DX is too big and pricey to appeal consumers who want a dedicated e-reader, yet too limited to function as an e-textbook device in academia. A 2009 study by Princeton University slammed the Kindle DX for its slow performance and weak annotation tools. And while Amazon has enhanced the DX since then, the device, with its non-backlit screen and clunky keyboard, is increasingly falling behind a growing number of newer, flashier slates. The Kindle DX needs either a major overhaul or a quick burial. If the latter occurs, it'll likely come right away. The holiday shopping frenzy is just weeks away, and Amazon is about to begin a marketing blitz for its new tablet. E-reader prices will likely fall as well. IDC analyst Tom Mainelli told me last spring that e-readers from major vendors (e.g., Amazon) would probably fall to $99 by the holidays. 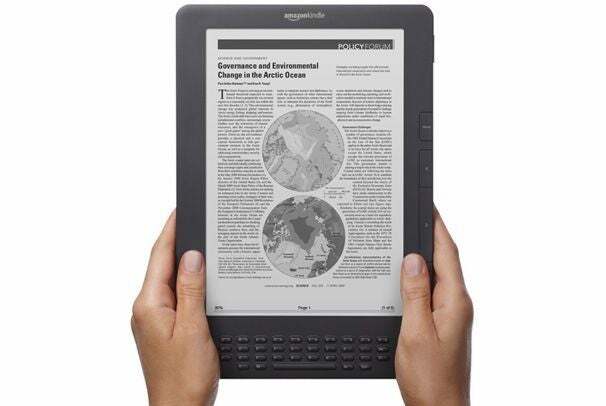 And Gartner analyst Allen Weiner wrote in May that the $50 e-reader would arrive soon. So where does that leave the Kindle DX? Perhaps Amazon will mimic HP's closeout strategy with the TouchPad tablet and sell the DX at a too-good-to-pass-up price. My prediction: the Kindle DX at $179 while supplies last. What would you pay for one?